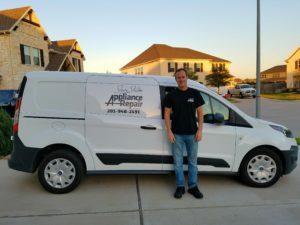 Based in Katy, Appliance repair is all we do. Lots of times I need to see whats happening inside of a dishwasher. I didn’t have a really good way to do that until now. I purchased a SJCAM 4000, which is a fairly in expensive camera, but its like a GOPRO and has a waterproof case. I can also stream live what the camera is viewing to my cell phone. I put a light in a zip lock bag inside the dishwasher and put my water proof camera inside and i can watch what happens inside the dishwasher live on my phone. Its pretty cool! If you need dishwasher repair in the Katy area, please give me a call! My 1997 Ford Ranger finally gave out on me after 280,000 miles. I put 155,000 on it over the last 5 years repairing appliances here in the Katy area. That’s a lot of appliance repairs! It served me well over the years. My new vehicle for servicing appliances is a 2017 Ford Transit Connect. It has quite a bit more storage space and everything stays dry without having to be stored in a storage box in the bed of the truck! I can carry lots more appliance parts so I can fix more appliances on the first visit! Look for me in my new van driving around the Katy area! Be sure to honk and wave! Many customers call me with a gas stove top that is continuing to click. This almost always happens after something has either boiled over or has spilled onto the burner control knobs area. What happens is that the liquid from the boil over gets into the switches and shorts it out. If its just water, or a thin liquid, you may be able to let it dry out. I recommend that you unplug it or turn the breaker off for at least 48 hours. If it still clicks, or doesn’t work to light the stove top after that, you will probably need to have the switch replaced on the stove top burners. Some of the switch replacements are a relatively straightforward job while others can be a little tedious. If you are in the Katy area and have this problem, let us know if you need our help. 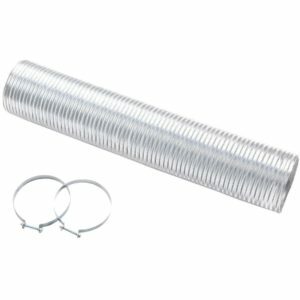 If your dryer takes a long time to dry, but you still feel heat, you probably have a clogged dryer exhaust duct. The first thing to check is the hose on the back of the dryer. It should be as short as possible and not kinked. If it is kinked, try to straighten it. The best vent hose to use is the rigid kind, not the super flimsy and flexible kind. If you clean the vent and it still takes a long time to dry, you may have bigger problems. You may need a professional to come out and clean it. I often find birds nest or just a lot of lint is blocking the air making it really hard for the dryer to run properly. I recommend my friend Joel at West Houston Dryer Vent Cleaning. He does a good job. You also might need me to clean the inside of the dryer before or after he cleans the vent. Lint filled dryers can cause fires! For appliance service, or to clean out your dryer in the Katy area, please contact Steve Slaton Appliance Repair. If you have a GE oven that has the buttons that are peeling off, you may be eligible for a FREE replacement panel and control board from GE. It is what I call an unofficial recall. The old style is 17.5 inches wide inset in the panel. The new one is a lot narrower. If your buttons on the oven panel are peeling off, call GE at 866-622-6184 and give them your model and serial number. They will send you a new touch panel and control board at no cost. If you need help installing it, contact me Steve Slaton Appliance Repair. If you decide to install it yourself, make sure you turn the power off! 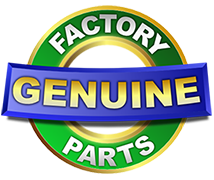 We use genuine replacement parts, this insures that your appliance will be as good as new. Should I use Self Clean in my oven? Steve has been the most honest and affordable repair person we have encountered. In one instance over the phone he diagnosed a problem for me and led me to just bite the bullet and get something new instead of just milking me for a service trip. I have had him work on the fridge, sink, dishwasher and he diagnosed my washer as well. If you are looking for great service and an honest repair man....Steve should be your first and only call. I called Steve about my refrigerator and he told me the technician would be at my home between 4-5. At 4:15 my door bell was ringing! The Technician, David was knowledgeable and fixed the problem in less than thirty minutes. The control board had to be replaced and he seemed to instantly know what the problem was! I will be recommending Steve to others that are having appliance issues, thanks for your service!! Steve arrived at my home on time. He did a thorough assessment of why my dryer might not be heating. He identified the faulty heating element and had it replaced in under 15 minutes. The price was reasonable for parts and labor. And now I can get the laundry back on line for this family of five. Thank you!!! Steve Slaton is an honest, experienced and trustworthy appliance repairman. This is very uncommon today. He returned my call within 30 minutes and attempted to talk me through a fix for my non-draining dishwasher. When I could not figure it out, Steve came to my home in Katy, TX within 30 minutes and found the debris that was blocking the drain pump and repaired it in about 20 minutes. His fee was outrageously low and was 4 times less than the Sears Home Services annual repair agreement that they tried to sell me. Call Steve Slaton to save time and money. First experience was fantastic. Steve is so friendly and knowledgeable was able to quickly diagnose and repair this issue. The rates are very reasonable. If you need appliance repair I highly recommend Steve Slaton Appliance Repair. This guy is amazing, our LG refrigerator was giving us an error message and without asking for all the details and model number and not a single dime, he let me know how to take care of the problem and told me everything I needed to know and was so kind! If I need further help, I will be calling him and for any future problems. Steve took my call after 5pm, his tech David out the next day to diagnose and fix the heater on our clothes dryer. Impressed by David, efficient young man, courteous , knows his trade. They use original OEM parts and had the part on the truck. Markup was fair . Labor pricing was fair to good . Only down side was parts and labor warranty only 90 days which I thought could be better . I'll use them again. Steve is very knowledgeable and helpful. We had some water standing in our dishwasher (half an inch). Since it is 13 years old, Steve recommended getting it replaced instead of repaired...very upright as they do not install new ones. Also, he suggested checking the air gap - a quick two minute action. It was indeed blocked, and cleaning it up has our dishwasher going again. Thank you Steve! Called Steve in the morning on 10/25/2018, he said his service tech Raul would be at our house between 1-2 in the afternoon to fix our microwave. Raul was here at 1:05, opened up the microwave and found that one of the three switch's was bad. Raul changed out all three switch's, because if one is bad, the other two are not far behind. Raul was very nice, neat and clean with his work. I get at least three bid's when getting anything replaced or repaired. Well, you know who won....Steve Slaton. He will be my first and only call from now on. Best experience ever! I agree other customers reviews, he is such a straight person, do not waste your time and money! Steve repaired my Samsung dryer in the past, and was very reasonable and prompt. I called him on my washer, and after I took a look at it, Steve recommended to replace it, without ever having come out. He could have come and made a repair, only to have it fail again shortly. Steve is my go-to for any and all appliance repair! I have to admit that I was blown away by the speed, professionalism, price, everything. My entire concept of home repair services has been changed since using them. I highly recommend this company and their services. Steve, the owner answers his phone and returns calls promptly. David was the tech that came to our home. He fixed the issue with one freezer quickly. He made the suggestion of ordering a small part so that my husband could repair the other ice maker without extra costs. I had a follow up question and Steve promised to send a technician out or he would come if the part did not fix the problem. Super service. Reasonable price. Friendly. Give this company a try. They are a local business in Katy that you can trust. Great guy. Great service. I called Steve’s office at 5:30 PM on a Thursday because the ice maker on my LG refrigerator/freezer had not worked for several days. He called me back 30 minutes later and set an appt. for 2:00 the next afternoon. Steve rang my doorbell at 2:10 PM Friday and was able to diagnose the problem within 20 minutes. No parts were needed. It was a simple fix. I was amazed. I was only charged his callout fee. This is a company you can trust for your appliance repair. David was AWESOME! He was very polite, knowledgeable, and efficient. He was able to diagnose our issue, order parts, and repair both of our appliances within 2 days. Before leaving, he made sure that they were working and cleaned up after himself which was much appreciated. We highly recommend him and the team at Steve Slaton Appliance Repair. This guy is so amazing. He came to our place to check what was wrong and give us a quote for which he wasn't going to charge and ended up repairing our dishwasher. He is very genuine and doesn't overcharge or try to rip you off. Very professional and clean. He gives you the true picture! l just used Steve Slaton Appliance Repair! Use him! I called him last night leaving a message telling him that my dryer wasn't working he called me back the very next morning, Saturday morning, to speak with me. He asked me a few questions over the phone and he knew exactly what was wrong and how to fix it. Even though he doesn't work past 1 on Saturday he squeezed me in. He came over fixed it at a good price and did an excellent job! I would recommend him to anybody at any time! Very fast, professional, and well priced!!! Great customer service and well prepared. Very rare today and a refreshing change! We repair most major brand name appliances.